Johnson, now Organist of St Paul's Cathedral. Tickets for the concert are selling quicker than expected so you are advised to visit the Northampton Bach Choir web-site (see below) for details of how to book tickets. The Choirs are also preparing for their next tours - on Monday 9 August the Girls and Men begin a week's tour of the Republic of Ireland, centred on a residency at Christ Church Cathedral, Dublin, where, on the Feast of the Assumption, they will give the Irish premiere of our 2010 commission, James MacMillan's Ave Maria. This motet will have been given its first performance in St George's Chapel, Windsor, only a few weeks before, in the presence of the composer. On Saturday 23 October the Boys' Choir will be touring Denmark and giving the first performance of "Fire hellige sange" (Four sacred songs) set bi-lingually in English and Danish by our Director of Music, Lee Dunleavy. This is his second set of bi-lingual set of motets for the Boys' Choir, the first "Fünf heiligen Lieder" (Five sacred songs) were first performed in our twin-town of Marburg in Germany. 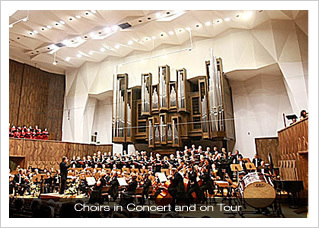 The Choristers are pictured here (standing on the stage right Gallery) on their most recent tour, singing Britten's War Requiem in Lublin, Poland, at a performance marking the exact date of the 70th anniversary of the invasion of Poland, the event that began the Second World War.